You may back-up (Save) your ShoWorks data file to protect your data, or to transfer your data to another computer. Important! Many users make the mistake of confusing which files they have opened and often end up working in a backed up file while later working in a different file. This causes them to believe that data is missing when in fact they are working in multiple files. KNOW YOUR FILE NAME AND LOCATION! 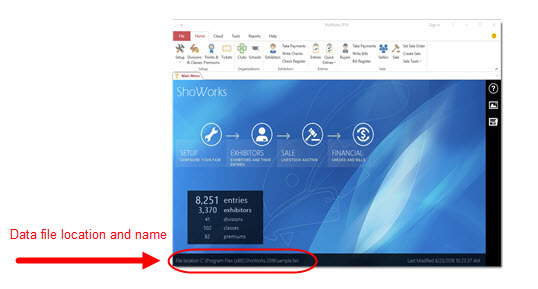 Tip: Your data file name and location can be found on the main menu at the VERY bottom of the ShoWorks screen. Click File then "Backup Data". Note the location and name of your data file - this is listed at the top of your ShoWorks window. Open Windows Explorer and locate your data file (found in step 1 above). Highlight the file by clicking it once (do not double-click because doing so will open the file). Select Edit > Copy from the menubar. Select Edit > Paste from the menubar. This will paste a copy of the file in which you can later revert to (by opening it). If the data file you wish to back-up is not currently open, open it by selecting "File" then "Open Data File..." and clicking on the file you wish to open. Then click "Open". Select "File" then "Save Copy of Data File As...". Determine the location (folder or directory) where you would like to save this file as a back-up to and select it from the "Look in" drop down box. You may want to back up your data file to a floppy disk however it is advised to save it first to your hard drive and later copy this to a floppy using Windows Explorer. Type a name for this file or select a data file that may currently be displayed. If you select an already existing data file, it will be overwritten. The current file will be saved (note, if you did not choose 'Save Copy of Data File As' and instead chose 'Save Data File As'" then the new copy will now the current loaded file.